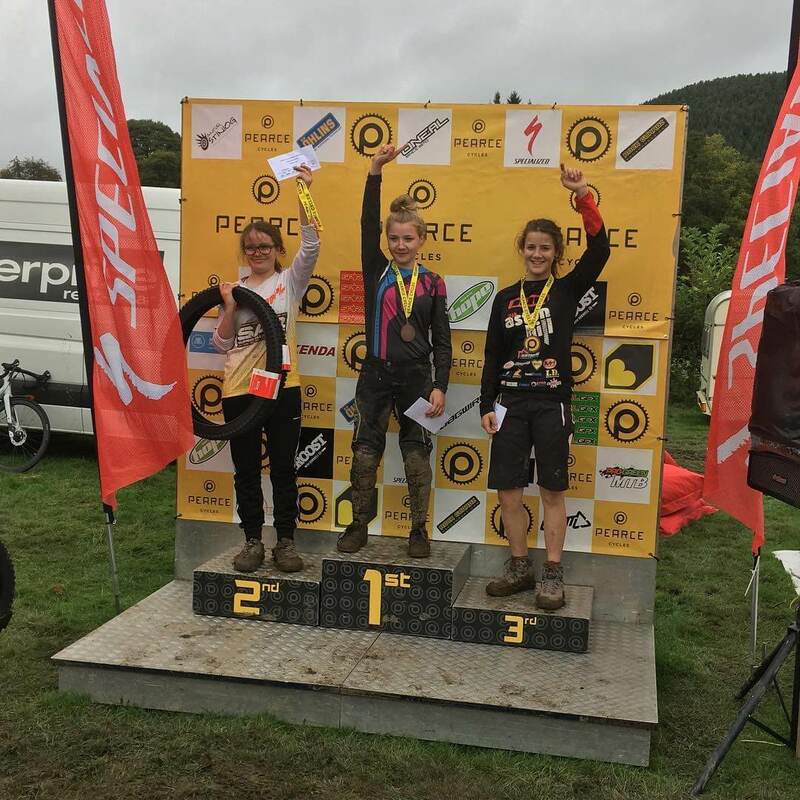 The final round of the Pearce Cycles downhill series was held at Bucknell on 1st October and proved to be another wet sloppy race! With riders slipping and sliding into the finish area Corinna managed to put in a clear race run and picked up 1st place in the Junior women’s category and fastest woman down. Here’s Corinna’s race report. After a week away on a family holiday in Portugal and returning at 3am on Saturday morning it’s fair to say I was a bit shattered driving up to Bucknell later that morning. Feeling slightly unsteady at the fact I had obviously not had time to walk the track like I usually do I was a apprehensive about riding blind. After eating some stodgy banana I was ready to go up the hill… bit nervous and feeling not so fresh, I had an awful first practice run but doesn’t everyone? Once I got into it I was loving the track, it was wet and hard to ride in places but a hell of a lot of fun. The hardest part of the track being the finish field I was struggling to hold any pace through it as once the rain had settled in that afternoon it had built some mega ruts and some lethal, sloppy mud in the turns. I was really enjoying the track and felt I was riding well, even though I wouldn’t say I’m one that usually loves riding in the wet and I had fallen off plenty of times that day too. I had realised throughout the day that their were some fast girls on track that I always try and ride as fast as at previous events but never seem to be able to get up there… I tried not to let it bother me and was just having fun riding my bike. Once I finished up practice (plastered in mud) and bruised, I was looking forward to tucking into a pork bap courtesy of Pearce Cycles… it definitely hit the spot. Waking up feeling more chirpier than the day before after a pleasant night sleep in the tent… I was buzzing to get back up the hill and try and make it down without hitting the deck. Practice went well and I managed to get some clean runs in, no more rain had come so the track had become claggy and hard to ride. The field had become treacherous, not feeling very reassured watching so many people slipping and sliding over just before the finish. Going up for first race run I was pretty damn nervous to say the least, just because I really wanted to have a good result… I had been looking forward to this weekend for a long time. I came down and had an immense run but non surprisingly enough came off in the finishing field on an awful left hand bend… I went into second about 4 seconds behind the current leader. I was happy with the result considering I came off at the end of my run. I jet washed my bike, changed my jersey and feeling ready for my second run embracing all that mud… I went up the hill. Waiting at the top with peaking nerves I was just going through the field over and over again in my head and where exactly to go to maintain the most grip. Pushed off the line and all the nerves disappeared, I had some sketchy moments but a clean run! Crossed the line and didn’t really know what was going on.. rode over to the results screen and I was 5.8 seconds up from the rider in second!! Waited for every female to get down the hill and I worked out to be fastest woman of the day!! I couldn’t believe it and was over the moon, for once I had some luck and didn’t fall off in one of my race runs. Relieved and buzzing to finally be on the top step, also coming 2nd overall in the series… I felt exhausted and proud of myself – what perfect way to end the season! It’s great to watch how our riders have progressed over the season. To see all the effort Corinna has put into her riding this year be rewarded with that top step, and the buzz she felt, was brilliant to see. Well done Cory!